Refreshable braille devices are mechanical braille generated by computer-driven pins. And unfortunately, they’re really expensive. The price hasn’t changed much in the last 30 years … until now. 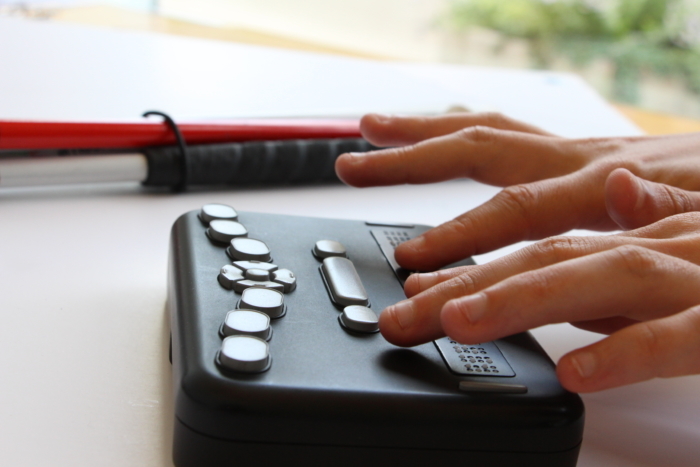 The Transforming Braille Group funded new technology development through Orbit Research. The goal was to make an efficient refreshable braille device with a price tag that doesn’t break the bank. Now, the Orbit Reader 20 is affordable, functional and available to all, with a dramatically lower price than ever before. Easy to navigate and designed with the user in mind, the Orbit Reader 20 is practical, well-designed and, best of all, only $499! There are numerous ways to use the Orbit Reader 20. It can be used as a Stand-Alone device. If you have braille content stored on a SD card, you can easily plug it into the Orbit Reader 20 and start reading. Its stand-alone capabilities include reading, writing and file management. Orbit Reader 20 starts as a reader displaying the content of files stored on the SD card. The youngest readers find it easy to get the next line of braille by pressing the panning button. For more advanced users, Orbit Reader 20 provides searching, bookmarking and note-taking capabilities. 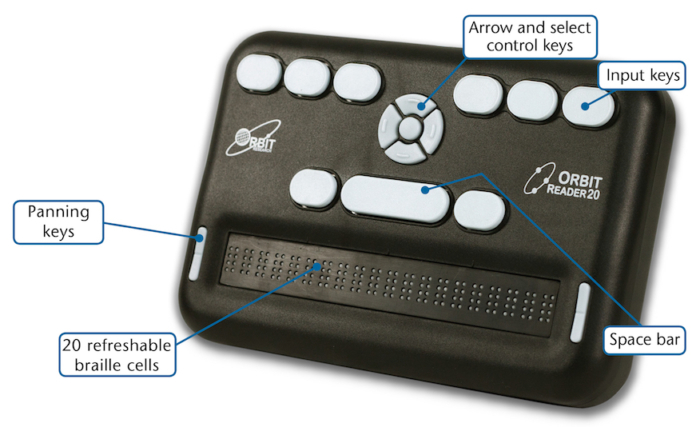 In addition to its use as a reader, Orbit Reader 20 lets the user create and edit braille. In remote mode, the Orbit Reader 20 becomes a terminal that displays the braille for the app running on the phone, tablet or PC. It works via Bluetooth® wireless technology with iOS and Android™ devices and through USB or Bluetooth for Windows®, Mac®, and any other operating systems that include a screen reader with braille support. In the USB configuration, Orbit Reader 20 supports both serial and human interface device (HID) protocols. This means that if the screen reader supports it, no driver installation is required. You can connect the device to your computer or tablet with the use of apps such as Kindle, Adobe Digital Editions or iBooks. Plus, connect to sources for high-quality braille like the National Library Service, American Printing House for the Blind and the National Braille Press. There are many options available for the user! The device has 20 eight-dot refreshable braille cells; eight braille input keys and space bar; five-way arrow and select control keys; two panning control bars; Micro-B USB charging/communication port; SD card slot; power button and Bluetooth radio. The Orbit Reader 20 provides a simple, well-built, inexpensive method to offer the prospect of literacy to more people who are blind and visually-impaired by dramatically reducing the cost of refreshable braille technology. Check out the Orbit 20 for yourself. Watch this introduction video!